I love apple season. I grew up in the Apple capital of Georgia so we used to eat a lot of apples every year. Baking with them is my favorite thing to do, though. You can't beat Apple pie, ever. 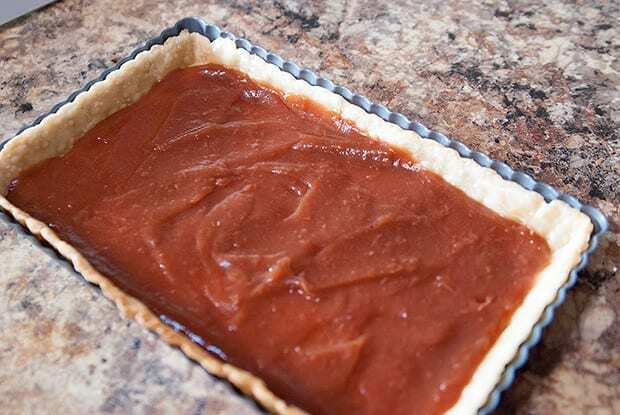 You'll need this Apple Butter recipe to make this delicious Apple Butter Tart. Take thawed pie crust and roll out to fit the tart pan. If it’s rectangular and there is extra dough on the width, simply cut off and add to the length if needed. With a fork, prick the dough all over the bottom and sides. Fit in a sheet of aluminum foil or parchment paper and fill with baking beans for pie weights. This ensures that the crust isn't too puffy. Bake for 10 – 15minutes. Set the crust aside to cool. It's time to slice the apples. Slice apples approximately 1/8th of inch thick. A mandoline slicer is the perfect way to slice them. 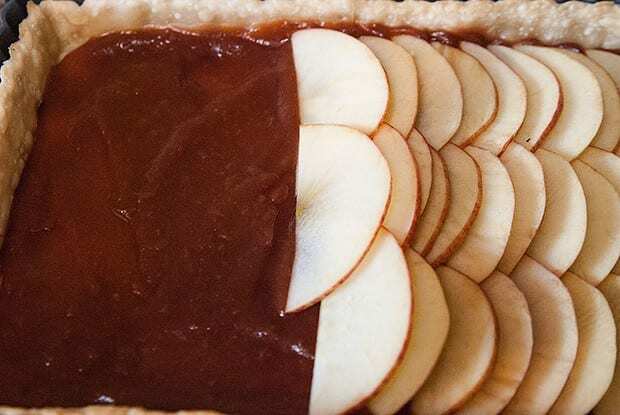 It’s optional to peel the apples, but the presentation is nice if the skins are still on the apple. 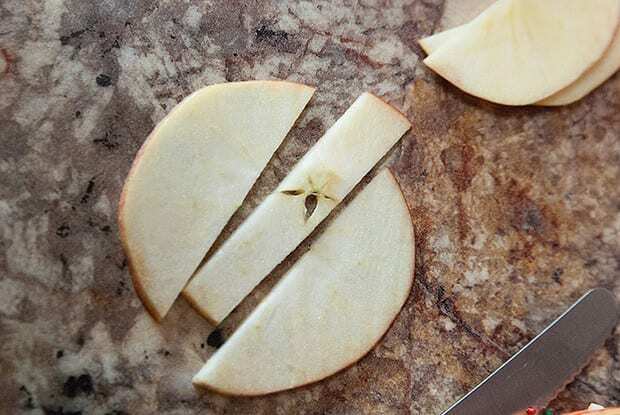 Slice the apple pieces in half to form a half-moon shape. 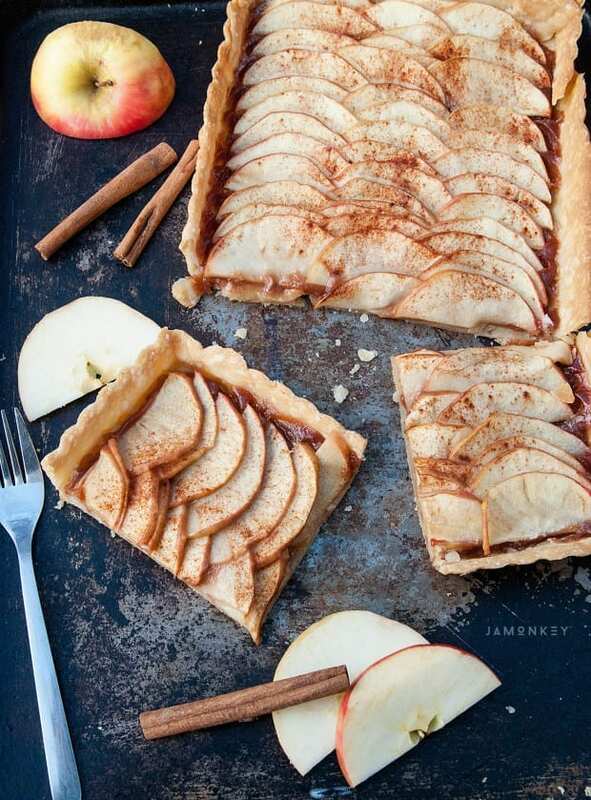 Spread apple butter over the base of the tart crust. 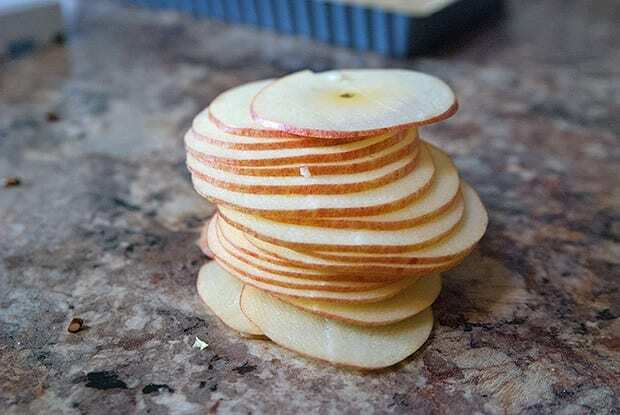 Place the apples slices in an accordion type shape, overlapping each other slightly. 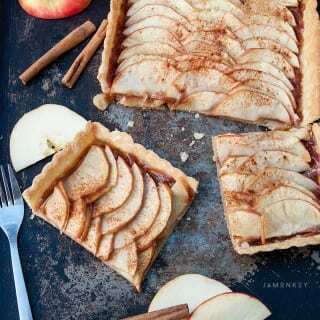 When the entire face of the tart is covered in the apple slices, sprinkle the cinnamon evenly over the top. 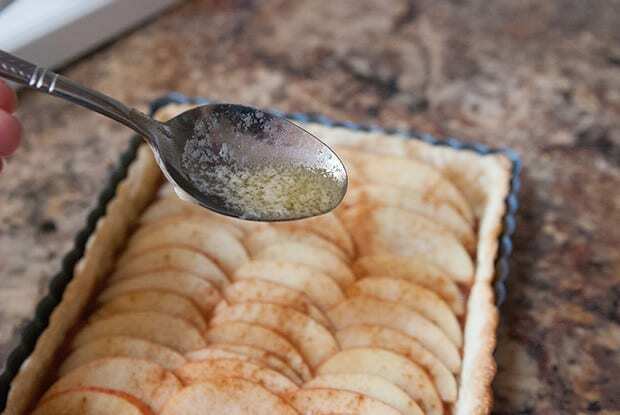 Drizzle the melted butter over the apples and place in the oven. You can serve it up with a bit of ice cream or whipped cream on top. 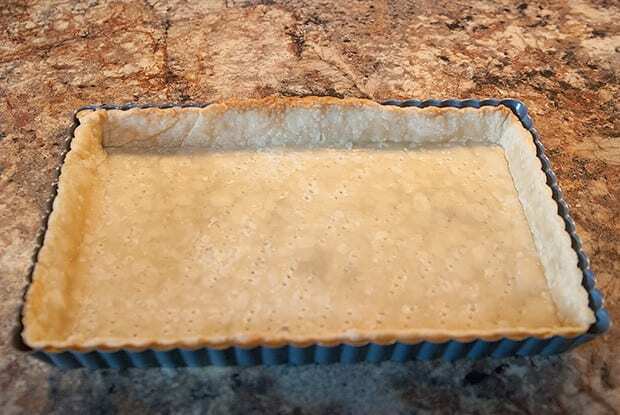 Take thawed pie crust and roll out to fit the tart pan. If it’s rectangular and there is extra dough on the width, simply cut off and add to the length if needed. With a fork, prick the dough all over the bottom and sides. 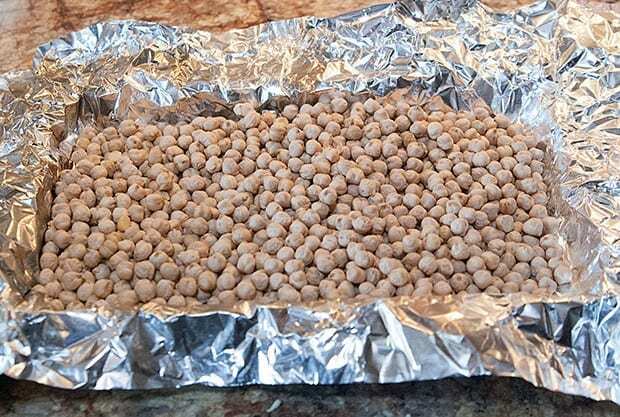 Fit in a sheet of aluminum foil or parchment paper and fill with baking beans for pie weights. Bake for 10 – 15minutes. 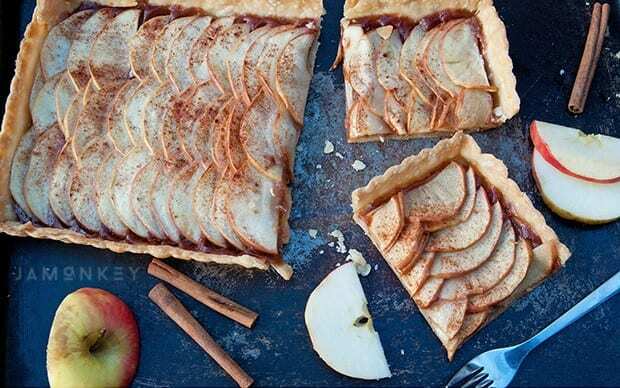 Spread apple butter over the base of the tart crust. 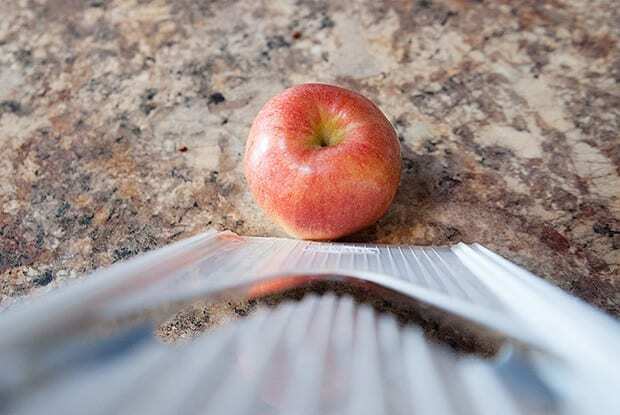 Slicing the apple pieces in half to form a half moon shape, place the apples slices in an accordion type shape, overlapping each other slightly. 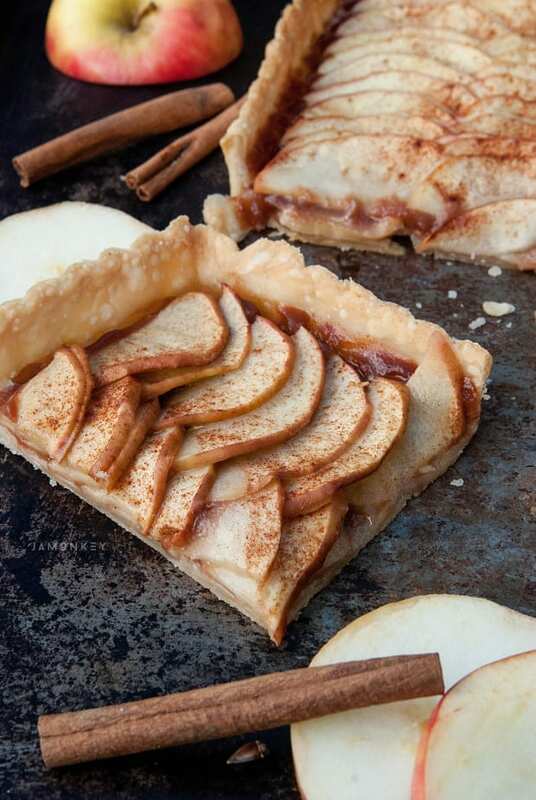 When the entire face of the tart is covered in the apple slices, sprinkle the cinnamon evenly over the top. Drizzle the melted butter over the apples and place in the oven. Bake for approximately 25 – 30 minutes or until the apples have softened but are not mushy. Cool the tart before slicing and serve with ice cream!